The law of attraction is impersonal. It operates just like a photocopying machine. The law is photocopying what you are thinking and feeling in every moment, and then sending an exact photocopy back to you — which becomes your life. That makes your ability to change your entire world so very easy. To change the outside world all you have to do is change the way you think and feel, and the law of attraction will photocopy the change. Is it possible for you to still enjoy your life? When I asked myself that question, at first I wasn’t sure. But as I pondered it, I began to see that there’s so much more to life than money. Why center my happiness and sense of self-worth around something that reduces to a number in a computer database? At the time, my number had a minus sign in front of it. And I had assumed that this tiny horizontal strip had the power to rob me of much of my enjoyment of life. I believed that without enough money flowing, I couldn’t fully enjoy my life. And so I created — yes, created — a lot of unnecessary stress and frustration for myself. I determined that even if I stayed completely broke for my whole life, I could still enjoy my life immensely if I really committed myself to that. I could still enjoy great relationships, long walks, healthy food (which grows on trees), stimulating conversations, writing, hugs and affection, and even world travel. Other broke people had enjoyed all of those things. Why not me? I soon concluded that a lack of financial success could not prevent me from creating a very happy and abundant life. A minus sign simply didn’t have that kind of power, unless I yielded my own power to it. It’s not the craving for more money that invites abundance. It’s the release of fear attached to being perpetually broke. Can you let go of your fear and resistance to being broke? Could you still enjoy your life even if you remained broke and in debt for the rest of your life? If you can do that, you will welcome the experience of true abundance into your life. What good is abundance anyway if it can be ruined just by changing a number in a database? True abundance should be unconditional, should it not? If abundance can be threatened, it’s not abundance; it’s still scarcity. Here is my monthly review post for February 2019. I would say the biggest win this month was completing 30+ days of raw foods. Learning how to live on a raw food diet was a fantastic growth experience. The longest raw food trial I’ve done before lasted no more than 2 days. Back then, I didn’t know enough about the raw vegan diet to succeed on it. This time around, I was more prepared and committed to see it through. You can read about my raw food experience & the benefits I experienced here. What makes me really happy is that I’ve continued to blog (nearly) daily at mastery.fm. I published my 100th post just a day or two ago. I initially started this blog as a notebook for myself. I wanted a place where I could curate a collection of personal growth tidbits & my favorite highlights from what I was reading and listening to. Along the way, some super lovely people have encouraged me to keep posting — a huge thank you to all of you! It makes me really happy to know that you appreciate this blog. Also, I like how this blog encourages me to share more of myself with you. I’m slowly leaning into writing more of my own articles. These monthly review posts wouldn’t even be happening without your support and encouragement. In addition to completing my raw food trial, I also completed 30 days of daily cardio. The first four days were 30 minute elliptical runs, but I bumped it up to 45 minutes daily for the rest of the trial. I did my cardio first thing in the morning, on an empty stomach. It’s a great way to start the day, and combined with raw foods, kept my mind sharp and clear. For the mental health benefits of cardio, I encourage you to watch this video. I didn’t feel any major breakthroughs after I completed my heavy-metal detox. It’s possible that there was an effect, but I may have missed it because I did the detox in parallel with daily cardio and raw foods. I wasn’t consistent with this habit, even though I know how important it is for me. I’d love to get back into some form of daily conditioning this month. It might help to start small… 20 minutes of daily audio, or 20 minutes of daily reading, and to stay consistent with it. One thing I discovered recently is that Spotify has a wide variety of motivational tracks, such as this, this, this, this, and this. I had no idea there was such an abundance of inspirational tracks available. This is an excellent way to condition your mind daily. I somehow got involved in collaborating on a short film with a few cool people! This will be a no-budget short with a few friends that we’ll shoot in March. It’s the first time I’ve been involved in the creation of a film, and it’s a perfect starting point for me. One of my goals in life is to be a film director. Rather embarrassingly, though, I haven’t done anything about it… until now. I have to acknowledge the Law of Attraction here, because I feel like this opportunity fell into my lap. I simply mentioned that I was interested in directing and cinematography to someone, and suddenly found myself involved with this project. So, thank you Universe, for bringing this opportunity to me — and thank you to all the people involved in this short film! Always let others know about your intentions, your goals, and your interests. You never know who could help you out or give you an opportunity, if only they knew about your desires. One thing I want to focus on in March is really experimenting with the Law of Attraction. Over the years, I’ve read several books on the intention-manifestation model, but I haven’t truly applied the processes & techniques on a daily basis. For example, despite blogging about it, I still don’t do 20 minutes of daily visualization. Just integrating that habit into my life would be a great starting point. Another habit I’d love to foster is the habit of appreciation & gratitude. I recently read The Magic by Rhonda Byrne, which is all about the power of appreciation. It opened my eyes to what being grateful actually means, and whether I’m truly thankful for the abundance in my reality. Am I really appreciating the gifts in my life? At the end of the day, it’s not about “doing the Law of Attraction”. It’s about who you are at the core of your being. What is the code running inside your brain? What are the thought patterns & beliefs that are influencing your life? How much airtime are you giving to your dreams and goals, and how much airtime are you giving to observing what-is? What I would love is to really dive deep into this space in March, and see if I can experiencing a shift in myself and my thought patterns. I maintain the belief that reality is 100% on my side. This is not based on evidence. It is based on choice. The evidence comes after the choice, not the other way around. I even believe that reality conspires to go out of its way to help me, and I see evidence of this constantly (again, only after I chose this belief). And so this is what my experience of reality becomes. It’s full of pleasant surprises. What if the whole time you’ve been here, reality was conspiring to bring you the most heavenly experiences imaginable, and all this time it’s been waiting for you to get with the program? Reality has been functioning perfectly — within established parameters. But perhaps you’ve been slacking off in the imagination department. Have you been dwelling on what you’d love to experience and willfully summoning it, or have you been muddling your mind with thoughts of perpetuating more of what you don’t want? If you love what you’re experiencing right now, you can just keep observing that, and it will self-perpetuate; if that’s you, you’re already golden. But you can’t afford to let your mind dwell on your observations and their extended predictions if you’ve already established the pattern of creating experiences you don’t desire to eternalize. If you want to break the pattern of what you’re already experiencing, you need to shift your energy from observation and prediction to unfettered imagination and creation. Essentially that’s a time management challenge — spend less time noting your observations and more time creating your desires. If your observations aren’t cool anymore, stop feeding them. In truth, observation and creation are actually the same mode. There’s really only one mode: creation mode. You get to experience what you imagine as real. But in observation mode, you’re filling your imagination with more of the same, and so you create and experience… bingo… more of the same. Sometimes that’s a brilliant choice. Other times it’s a rather pathetic choice. My biggest win this month was completing a 30-day raw food trial. Learning how to live on a raw food diet was a fantastic growth experience. The longest raw food trial I’d done previously lasted no more than 2 days. At the time, I didn’t know how to get enough calories from raw foods, what food I would eat day-to-day, or the ratio of fat/fruit I’d need to stay satiated throughout the day. This time I did my research, I stocked up on fresh produce, and I added an accountability factor. During the first week of the experiment, I also read all of Steve Pavlina’s raw food logs, so as to keep priming my brain with the raw food lifestyle. I think the key to succeeding with raw foods was having the curiosity to really go down the raw food rabbit hole, and making a committed decision to give it my best shot. Everything else fell into place from that decision. The first few days I still had some cravings for cooked meals. After my taste buds adjusted to raw foods, though, it was fairly easy to continue eating raw. It became even easier after I got a Vitamix, and was able to start making delicious smoothies at home. I definitely recommend a Vitamix for anyone attempting to eat raw. It makes the whole experience way easier… and fun. My whole attitude towards greens changed when I discovered the joy of banana-spinach-kale smoothies. Thanks to the Vitamix, I probably consumed more greens during my raw food month than any other time in my life. In the beginning, I didn’t actually commit to 30 days of raw foods. I simply made a decision to do my best, one day at a time, and see how long I could last. Sometimes it’s easier to follow through on a habit when you give yourself permission to stop tomorrow… and you can keep delaying ‘tomorrow’ day by day, extending your streak. I think it was around day 14 that I actually committed to going the full month… at that point, my framing of raw foods had shifted from “this is challenging” to “this is easy”. My taste buds had adjusted, I was enjoying the energy of raw foods, I was loving my new Vitamix, and it was easy to commit to another two weeks. The primary benefit I experienced from the raw food diet was an abundance of energy. I felt clear steady energy the whole day. There was never any “dips” in energy the way you’d feel after a large meal, or the way you’d feel after a caffeine crash. During this experiment, my taste buds became a lot more discerning, and raw veggies suddenly became much tastier than usual. For example, before this experiment, I would never have had the desire to eat a raw stalk of celery by itself. During my raw food trial, though, celery became delicious. I could taste so many subtle flavors in it! Celery, cucumber, mushrooms, avocados, tomatoes… it was like I was tasting them for the first time. The experience of eating raw foods by themselves was much richer than I had expected. Finally, I really liked that eating a raw food diet made it impossible to overeat or “emotionally eat”. Beyond the first few days, there were no cravings for comfort food whatsoever. I felt a much more conscious relationship to the raw foods I was eating. And it felt really good to give my body an abundance of nutrition! Someone asked me if there were any difficulties during the experiment. I would say the only challenge was the social aspect of eating raw while hanging out with non-raw friends. I think I was slightly less social this month because of raw foods; I’m not sure how I would deal with that if I was going to eat raw long-term. Think about how often food and friends mix together. Grabbing a coffee with a friend, sharing a meal, being invited over for dinner… food is intricately tied into our culture. Of course, it’s possible to bring your own raw food & raw snacks everywhere you go. For 30 days, it’s certainly doable. The challenge arises when you begin to consider staying raw long-terms. I’d imagine that travelling would also be more challenging while eating raw. It’s easy to stay committed to raw when you have your own place, your own Vitamix, your own place to store fruit and give it time to ripen. On the road, though, you’d have to put in a bit more effort and planning into it. That being said, I’m sure eating raw while travelling is possible, especially if someone already has prior experience. I completed my raw food trial after 33 days. After the experiment, I indulged in various cooked and processed foods, and I started drinking coffee again. The question is… was it worth it? At first I was excited to be able to eat cooked foods. It felt like being a kid in a candy store. And I have to say, the caffeine initially gave me a fantastic burst of energy. However, now that it’s been a few days, I can feel my energy levels are all over the place. Some of my cravings for cooked foods returned. I’ve noticed myself getting distracted by food. And I’m more likely to make my what-to-eat decisions emotionally, which wouldn’t happen on raw foods. Overall, I would say that eating cooked food doesn’t make me any happier. I’m still glad I went back to the “dark side” after my raw food experiment, and experienced the contrast between cooked vs raw… but now I’m inclined to get back into raw. Or at least 80-90% raw. Either way, I’ll keep experimenting! A very powerful lesson that I’m still integrating into my life is: Feel grateful no matter what. No matter what your situation looks like right now, you can always find something to appreciate. Even when it seems as if the whole world is against you and everything in your life is breaking down, pause for a moment and find something to appreciate in that moment. Appreciate the growth challenge. Appreciate your next meal. Appreciate that my blog is here for you as a free resource. If you can learn to relate to life on the basis of unconditional gratitude, thanking life for whatever it sends your way, you’ll transform your whole experience of living. Life will become a true gift instead of a struggle. You can’t do battle with life and expect to win. To condemn what’s arising in your life right now only makes you powerless, and it drops you to a vibe that’s only going to attract more scarcity. Please do the best you can not to relate to life on the basis of neediness. See if you can conclude as I did that no matter what happens with your finances or your relationships, you can still enjoy a rich and rewarding life. Once you know that’s possible for you, it’s much easier to relate to life with a sense of appreciation and gratitude. And this is a very attractive vibe indeed. You don’t need anything more. You are whole and complete just as you are. Your life is already rich and abundant, if you will only choose to look. Life has been trying for years to say “I love you.” Would you kindly take a moment to acknowledge this? The key to abundance is to stop needing more, and start appreciating what you already have. Life can be very generous with those who cultivate a sense of appreciation. Even when it seems like you don’t have enough, could you allow yourself to perceive that perhaps you already have more than enough? Is it possible that you already have everything you need to be happy? I’ve had people ask me how I became wealthy and well, the short answer is: I decided that I was going to be poor. For many years, I had a poverty reality. It really was terrible, to the point of living in a shack of a mobile home with holes in the floor and a car that required hood-lifting and tinkering to start. I resisted this reality with almost every fiber of my being. I wanted, reeeeeally wanted, to be wealthy, but nothing in my physical reality was even a whiff of wealthy despite all the affirmations and visualizations and rampages. I didn’t get it and I was feeling pretty resentful of people who did. So, I gave up……I decided that I was going to be poor the rest of my life and I’d just have to deal with it. Actually, I do remember getting all dramatic about it and declaring that God must have decided that this was my lifetime to live as the poorest person on earth. I was tired of trying so hard. I decided that I would accept my “poorness”, I got ok with it. Within thirty days, the Universe delivered in abundance and I’ve never been back down the poverty reality road again. It literally rearranged itself and events and circumstances boomed together and I moved from that shack of mobile home. Am I grateful for what I have today? Absolutely! Today I’m living the vibrational escrow of that poverty stricken 28 year-old that would not have believed it was possible. But, I didn’t leave that mobile home being grateful and appreciating the new condo I live in today. I left it appreciating the holes in the floor. That was *my* bouncing off place. The subject of self-appreciation is literally at the heart of everything that everyone that you know is living. Law of Attraction means that that which you are, that which you are feeling, that which you are oozing, that which you are thinking, that which you are vibrating, that which you are being, that which you are… is your point of attraction. As you think and feel, you attract. You are the attractor of your experience. Not one other in all of the Universe has anything to do with what is coming to you. And so there is not a more important topic or understanding for you as an individual to come to understand than how to feel good about you, because the way you feel about you is your very basis of attraction. If you are wanting to come into the full appreciation of self, we would encourage you to write in your Book of Positive Aspects—which is nothing more than a notebook called positive aspects—write pages upon pages upon pages of positive aspects that you see about you. And if you don’t see any today, then write: I want to see some positive aspects about me. We would encourage you to look for your value everywhere that you can. Look for reasons to adore you, and what will happen is, every time you think a thought that is in harmony with that which your Inner Being knows to be, you will feel good. Every time you think a thought that is not in harmony with that which your Inner Being knows to be, you will feel bad. By paying attention to the way that you feel, you will begin to notice that when you’re thinking thoughts that are praising yourself, you feel good. And when you are thinking thoughts that are diminishing yourself, you feel bad. When you are thinking in terms of “I can, I can, I can”… you will feel good. When you are thinking in terms of “I can’t”… you will feel bad. This is an individual process, whereby you as an individual decide that you want to feel good about you. When you feel good about you, you are vibrating positive energy. When you vibrate positive energy, you are positively attracting. If you are wanting all of those things to come to you, which includes the mate you have been wanting, the money you have been wanting, the work that is more satisfying and more fulfilling, the new house that you are wanting, the car that you are wanting—all of those things of a physical or non-physical nature that you have been wanting—the re-claiming of your perfect bodily health that you are wanting… If you are wanting any of those things that you are identifying as your desire to come into your experience, it is absolutely imperative that you come to a place of positive vibration… which means you MUST adore you. If you do not like yourself, then you can want until you are blue in the face, and those things that you want cannot come into your experience. The balance that you are wanting to bring into your life experience is the balance of appreciating you. And you appreciate you not all at once on the big things; you appreciate yourself one thought by one thought, one segment by one segment, one moment by one moment, by looking for reasons to appreciate yourself. 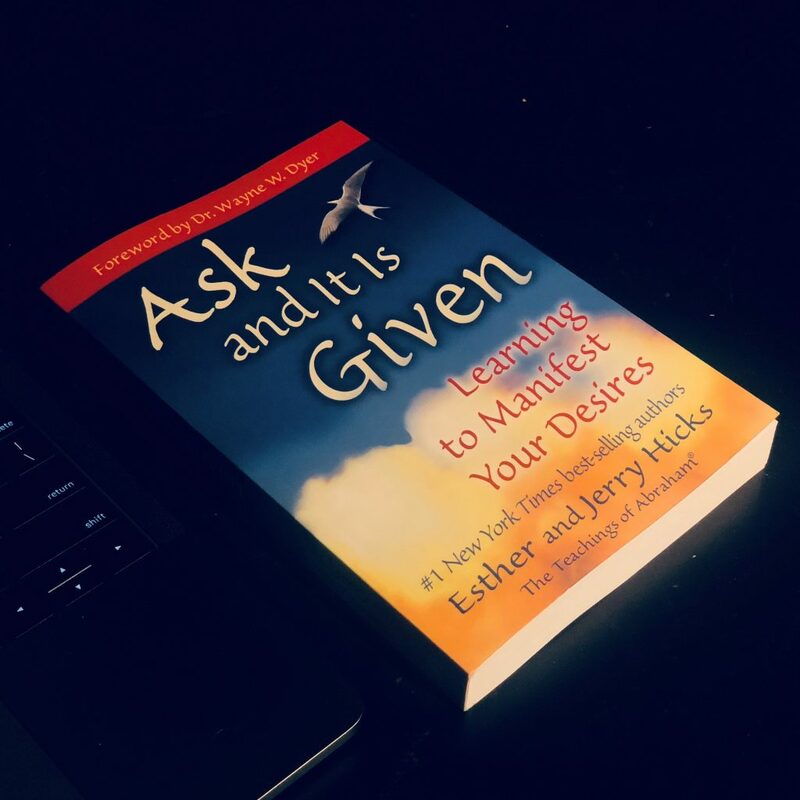 A few days ago, I was watching some YouTube videos of celebrities talking about Law of Attraction… one of them was the rapper Big Sean, who mentioned how much the book Ask and It Is Given helped him. I’m thinking to myself, “Ok, this is really cool to hear from people like him”, because he’s not affiliated with the self-help field. He’s not there to sell Law of Attraction books. He’s just an artist talking about what worked for him. His video reminded me that I should read Ask and It Is Given. I’ve listened to Abraham-Hicks’ material before, and love their work, but strangely had never read that particular book, even though it’s one of their most popular ones. Fast forward to today morning. I get a feeling to go to the Indigo bookstore, and check out Ask and It Is Given. I’m thinking “Hmm, but I have other things to do”, but the feeling persists. So I follow the inspiration. I drive to Indigo, intending to find a parking space, free of charge. We’re talking about the middle of busy downtown Vancouver. I get a hit of inspiration to take one of the residential roads, and what do you know … I find a totally free, perfect parking space, 1 minute away from Indigo. Terrific. I walk into the bookstore and hear the Harry Potter theme song playing on the speakers. Interesting… I had just watched HP7 on Netflix the night before. I find a copy of Ask and It Is Given, then head to the second floor where there’s some tables and chairs. Most are taken, but there’s a long table with some spaces, with a nice free spot at the corner of the table. Perfect. No one to disturb me, while I peruse the book and do some journaling on my laptop. Five minutes later, a guy in his 20’s sits down across from me, and starts working on his laptop. I feel a little bit self-conscious of my book on the table, thinking to myself, Hmm, is he judging me for reading woo-woo books?, but I let go of the feeling. As I’m reading the book, and trying out one of the written exercises in it… the guy across from me reaches into his bag and pulls out his own copy of Ask and It Is Given! What are the chances of someone who happens to sit right next to me, and randomly pulls out the same exact book that I’m reading, at the same time that I happen to be there! He tells me he picked up the book after watching an interview with Mike Posner. Posner was telling a story of how one of his friends in the music industry was always carrying around a tattered copy of Ask and It Is Given, and how much it changed his life. And who was this friend? It was Big Sean — who I had just been watching on YouTube the other day and who inspired me to get the book! How many times in your life have you been reading a book, and a total stranger started reading the same book at the same time at the same place at the same table? And you both discovered that you were led to the same book because of a random interview you had watched on YouTube? What a cool synchronicity!! The timing of it, the parallels, the details… It was like the Universe was bringing me sync after sync to show me the possibilities of this reality. When the universe fulfills some of your desires, in even the smallest degree, how do you receive them? Do you disdain them? Do you wish you never wanted them? Or do you accept them with appreciation and gratitude? How you receive these gifts will determine how they continue to come into your life. So if you want to improve your ability to manifest what you want and enjoy your manifestations even more, then receive all your experiences with appreciation and gratitude. Welcome them. Ask for more of them. Be thankful for them. And they will increase. This works with anything you desire — food, wealth, health, sexual expression, and so on. Feel gratitude for what you do have, and you will experience increase. As you pursue the fulfillment of your desires, you eventually satisfy some of them. At some point you get what you want. It might be just a little at first, but you do receive something. How much do you enjoy that experience? The degree to which you enjoy it won’t affect your drive to continue fulfilling your desires. Your drive will be the same either way. Your enjoyment is your reward though. So doesn’t it make sense to enjoy what you receive as much as possible? It is not the physical size of the reward that matters. It is the scope of the gratitude you bring to it. If you want to attract more of anything, you must effectively thank the universe for whatever it sends your way, no matter how small or insignificant it may seem. To attract greater financial abundance, be thankful for every penny that comes to you even if you’re totally broke. To attract better health, be thankful for the health and vitality you’re experiencing right now even if you’re overweight and sickly. To attract better relationships, be thankful for the relationships you already have even if you spend a lot of time alone.